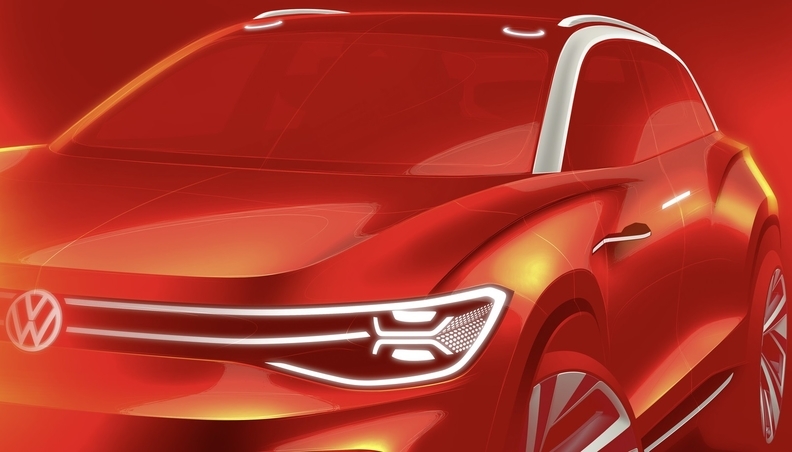 VW released a teaser picture of the brand's I.D. Roomzz concept. The Volkswagen brand's I.D. Roomzz concept teases a large full-electric SUV that the automaker is developing as a rival to the Tesla Model X. The roomy interior has an innovative seat configuration and customizable lighting, VW said in a news release Tuesday without going into detail. The concept "shows us what we can expect from full-size electric SUVs in the future. The puristic look emphasizes the clear function and the user experience is intuitive and natural," VW brand's design chief, Klaus Bischoff, said in the release. The I.D. Roomzz will have its public debut at the Shanghai auto show on April 16. The production version likely will be a three-row, seven-seat SUV similar in size to the VW Touareg. It is expected to go on sale in China in 2021, followed by the U.S. in 2022, and Europe by 2024. It will be a key part of VW's electric push in China and the U.S. It could be built in VW's U.S. in Chattanooga, Tennessee, media reports said. The I.D. Roomzz is based on larger version of VW's MEB electric architecture. The concept is VW's latest car based on MEB. The production car will be the flagship of VW's I.D. family of long-range electric cars that will include a Golf-sized hatchback for Europe, the Crozz and Crozz Coupe SUVs, and a retro-styled I.D. Buzz minibus. VW has also shown the I.D. Vizzion study for an electric sedan and the I.D. Buggy beach car. VW will need an electric SUV bigger than the upcoming Crozz and Crozz Coupe, the brand's sales chief, Juergen Stackmann, said last month. "Larger dimensioned versions that offer more seating capacity are in great demand at the high end of the market," he said. Audi previewed an MEB car with the Q4 e-tron concept at the Geneva auto show in March, while Seat showed the el-Born hatchback EV concept. Volkswagen Group plans to launch 70 full-electric vehicles by 2028 and build 22 million cars off various EV architectures including the VW brand's MEB platform and a premium electric platform called PPE under development by Audi and Porsche.